Did your mom ever make you a slice of bread with peanut butter...accented by a hand-drawn heart? Even thirty years later, I still think that nothing says I love you like gifts of homemade food or treats. No matter how the cook makes their mark on the package, it's always special because you know that it was made just for you. But, there does come a time when you've got to add a little sophistication and panache to your presentation. I give you the Williams-Sonoma Personalized Embosser. It's a notary stamp for foodies, complete with name or monogrammed initials. This embosser is perfect for the person who is always baking and cooking for others. Simply insert a golden foil sticker, press down, and seal the meal with your initials and a personalized message. There's options like "Recipe From...", "Cellar of..." and "Made from Scratch." 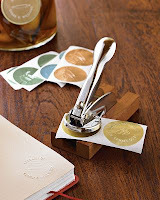 You can "notarize" a recipe, use a gold foil sticker or even a vellum gift tag. Homemade, quite artistic, and made with love. Remember, if you know where to find this, or any of the ideas on our list from a local business, please leave a comment and let us know where to go!